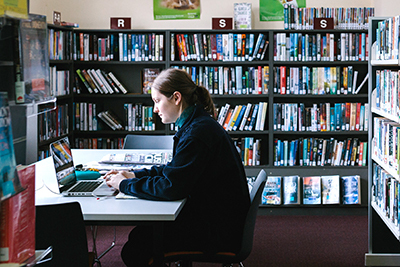 The Goldfields Library Corporation is an accredited eSmart Library. eSmart uses a cultural change approach to improve cyber safety and reduce cyber bullying. The Alannah & Madeline Foundation and the Telstra Foundation formed a partnership in 2012 to develop and implement eSmart Libraries – one of Australia’s most significant community cyber safety initiatives. The eSmart Libraries program provides a framework to help integrate better cyber safety practices and promote the safe use of online technology in communities. Understanding the issues faced by our patrons and staff regarding online experiences. We all want to have positive and safe experiences online and we want to support our patrons to achieve this. Reviewing and updating our relevant governance documents to ensure, as an organisation, we are all aware of good online practises and that we collect and store data appropriately. Providing information and resources to our patrons and library members to spread the eSmart message, this includes a series of posters of tips for staying safe online. Exploring ways of connecting with the broader community to provide useful advice and guidance. We do this through regular social media posts, displays at our branches and agencies and through our digital literacy training. Now that we are an eSmart Library, we will continue to deliver programs that disseminate the eSmart message and provide our communities with safe and accessible places to engage on line. Visit the eSmart website for more information. This site provides a range of programs and resources for adults and children to support safe online experiences. You can also find information on making a cyberbullying complaint and advice and strategies for dealing with these issues. A free service provided by the Australian Government, it provides easy to understand online safety and security information and solutions to help protect Australian internet users. An initiative of the Safe and Supportive School Communities Working Group, the site provides relevant information for parents, carers, teachers and children with information and ideas regarding what to do to stamp out bullying, including online. An Australian Government initiative providing information on online scams and a place to report scams. Provided by the Australian Government, the ACSC is a one stop shop for national cyber security resources to combat cyber security threats. Individuals can report cyber security incidents to help make Australia a harder target for cyber criminals.